I love beginnings, from opening a fresh jar of coffee to starting a new knitting project. There is something very special about beginnings. They are full of potential. Spring is really starting to ramp up and with labour weekend coming up its the traditional time of year to get out in the garden and get things started. Last week I signed up for a new ballet initiation course at the Auckland Academy of Adult Ballet (AAAB). 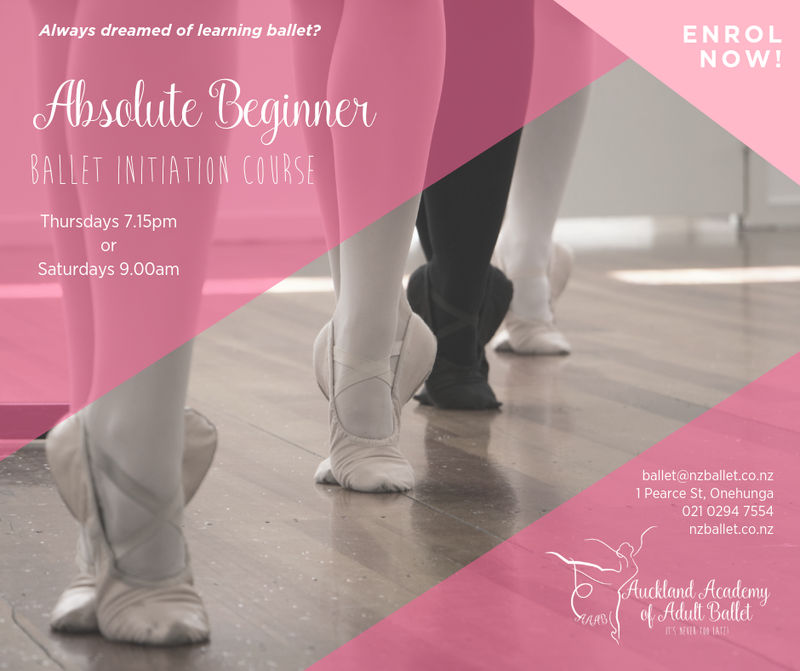 I did a few beginners ballet classes on my lunch break back in 2014 (blogged here) at a different dance studio but the experience at this new studio is very different and I prefer it. Before the first class we were sent an email with guidelines for what to wear (1. comfortable workout clothes like leggings and a t-shirt 2. socks or ballet slippers) and we were advised to wear hair in a bun. This is to allow the teacher to keep check on our posture and positioning and help correct errors. On the night we were met at the entrance by our teacher and as the others arrived we got to meet our fellow class participants. The only thing we had in common was that we were all female as there was a variety of heights, shapes & sizes, ages, ethnicities, abilities, etc. We got given an induction pack that included a headband and a car sticker - nice touches I thought - and the head/owner introduced herself and talked over the contents of the pack including how to access all the instructional videos at home! I've since used these videos and it great for at home practise and remembering arm positions and what tendu means! The first class was very basic, but I very quickly remembered from 2014 just how deceptively difficult it is. Only in ballet can standing up straight be such a workout and then moving the arms overhead be such a core workout! And we were given homework! We have 2 different exercises that we have to do every day and I get the feeling that this will grow in time. It was the next day that I had found my 5 year plan that I had written in 2014 and I was so saddened to see that I had not made any progress on any of my health and fitness goals - although, I did make lots of progress but then I stopped and now I'm right back where I started. The worst part of ballet class was seeing myself in the wall length mirror and I was actually surprised at how large I am - my internal vision of myself just doesn't match up with what I see. My goals are still valid and achievable, but while I'm really good at starting, I'm less good about seeing it through. I've looked through this blog at all the things I've started and I am embarrassed that I am no further forward. I even considered starting a new blog because there's only so many couch-to-5k blog posts that could be seen as acceptable on one blog, but that would just further enforce the pattern. So its time to start again - start everything again - and this time the focus is on sticking with it and seeing it through so that maybe next year, when my 5 year plan is up I will actually have achieved, or at least be pretty close to achieving, my goals.